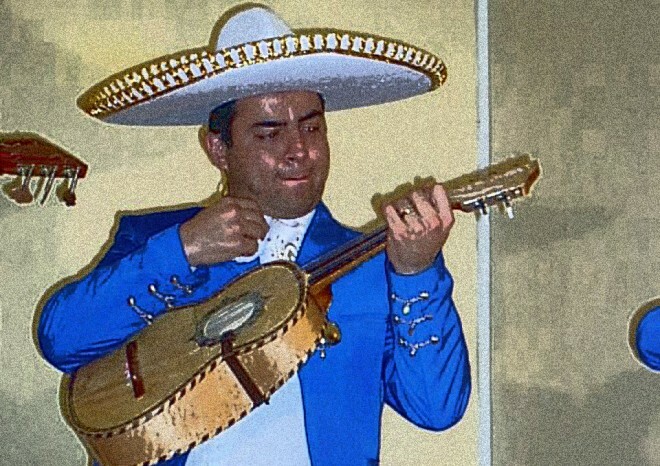 One of the first performances of one of the founders of the group Mariachi Semblanza: Miguel Angel Vallejo . On April 23, the death of the saint who is patron of Catalonia and Aragon, Saint Jordi, who died in the year 303, is commemorated. In Catalonia, traditionally since the fifteenth century, that day is the day of lovers and roses and books are given away. It is seen that the kings Pere the Catholic , Jaume I or Peter the Cerimonioso contributed much to the popularity of the saint, but despite being a deeply rooted popular celebration, it was not until 1914 that it was given importance due to the active impulse of the “commonwealth “which, let us say, was the first active institution that represented the Catalans and joined different regions. The legend tells that Saint George rescued a princess from being eaten by a dragon that was ravaging the lands of the community of Montblanc, and when the tears of the princess fell on the blood of the fallen dragon, they magically created a large pink red rose and that is why red roses are given away in this day and is conceived as the day of lovers. The giving away of a book is another story which added to the importance of this day. Well into the 20th century, the Valentine writer Vicent Clavel i Andrés , based in Barcelona, proposed to hold a party to promote and spread the book in Catalonia and the day chosen was October 7, 1927. But it seems that during the international exhibition in 1929 booksellers took to the streets to promote the editorial work and were so successful that they decided to change the date and the match did Saint Jordi in the spring. And so, on the feast of the patron of Catalonia books and roses are given away. In 1995, April 23 was declared the International Day of books and copyright and since then the Catalan tradition has had major approaches to different cultures in the world and Mexico is no exception. Celebrations of the Book in Catalan have been held in various cities of our country and Catalan culture has gained an important place in Mexico from such cultural approaches.